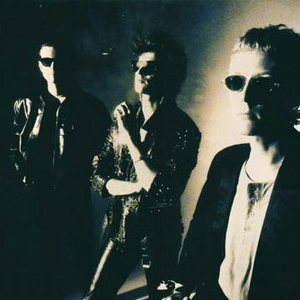 Love and Rockets is a post-punk band which formed in 1985 in Northampton, England Daniel Ash (guitar/vocals), David J (bass/vocals), and Kevin Haskins (drums) - all former members of English post-punk pioneers Bauhaus. Taking their name from the renowned underground comic book created by Los Bros Hernandez (Jaime and Gilbert Hernandez), their music is a mixture of goth, glam, psychedelia, soul and pop. The band is best known for their singles "Ball of Confusion" (1985, a Temptations cover), "No New Tale to Tell" (1987), "So Alive" (1989) and "No Big Deal" (1990). L&R's first album was 1985's trippy Seventh Dream of Teenage Heaven; Seventh Dream was followed in quick succession by 1986's Express;which featured a cover of Ball Of Confusion, which became a club hit. 1987's Earth * Sun * Moon and 1989's eponymously titled release Love and Rockets (all on Beggar's Banquet). Love & Rockets was met with cries of sellout due to the overly slick So Alive (the band toured stadiums following the hit single) and the group disbanded. Tracks recorded for an abandoned EP Swing were added to a reissue of Love & Rockets in 2002. After working on solo albums they reformed, recorded material for Hot Trip to Heaven which infused dance/electronica elements into their sound. Fearing the world wasn't prepared for it yet in 1992, they waited until 1994 to release it. A fire destroyed the studio they were working in, and all material was scrapped. The next album, Sweet F.A. features one of Daniel Ash's charred guitars on the front cover. The final album Lift was an epic dance/electronic swan song, owing much to producer Doug DeAngelis, who was given honorary L&R member status. After the Lift tour, they disbanded again in 1999 to work on solo projects, and to reform Bauhaus for a series of tours. L&R reunited in 2007 at Coachella. Plans for a 2009/2010 release fell through as the band went their separate ways again.